I am sharing the cut file I designed for my lanterns in my subscriber library. Click here to subscribe to my weekly newsletter and gain access to all the freebies. If you already have your password, click here to download them. I bought mine for $2 each at Target. 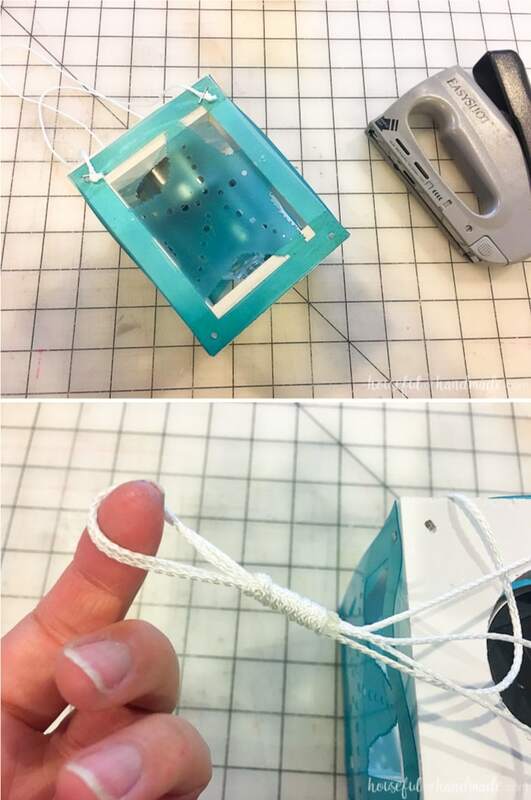 For each lantern you will need 2 pieces of 3 1/2 inch x 3 1/2 inch pieces. For each lantern you will need 4 3 inch pieces. Or you can use a hammer and finishing nails, but a nail gun is definitely faster. Cut your scrap of 1×4 board into 2 pieces of 3 1/2″ x 3 1/2″. In one piece drill a hole big enough to fit the top of your solar light. In the other piece drill a hole half way through that will snuggly hold the bottom of the solar light. Cut the dowel into 4 pieces 3″ long. Add a little wood glue on the end of the pieces and attach them to the corners of the 1×4 pieces with the finishing nails. 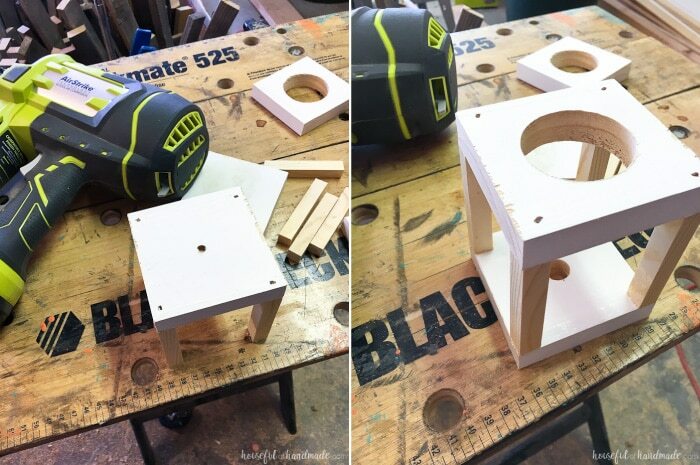 Add the other piece on the bottom of the 3″ dowels. Let the wood glue dry, then spray paint the wood frame with the white paint. While the paint dries, it’s time to cut out the decorative sides of the lanterns. 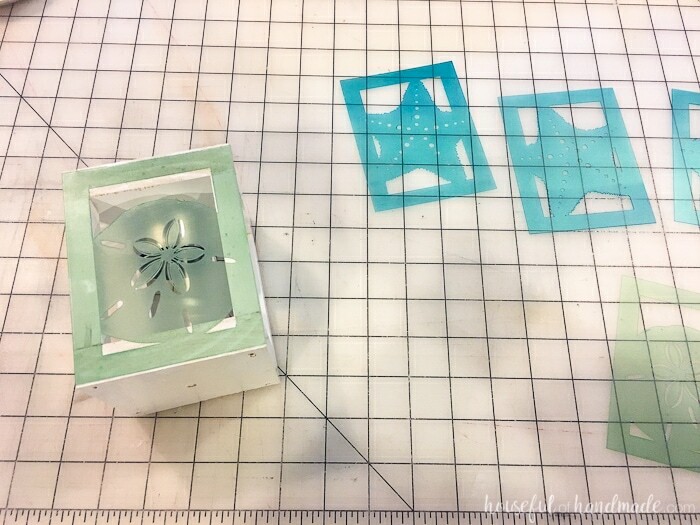 Cut 4 of each lantern design on the Silhouette using the following cut settings: Blade – 10, Speed – 1, Depth – 33, & Double Cut. I have found that if I don’t have a new blade, the clear plastic doesn’t cut well. But if you do not unload the cutting mat you can press Start and the Silhouette will cut the entire design again in the exact same place as the original design. The second cut will make the design pieces perfect. 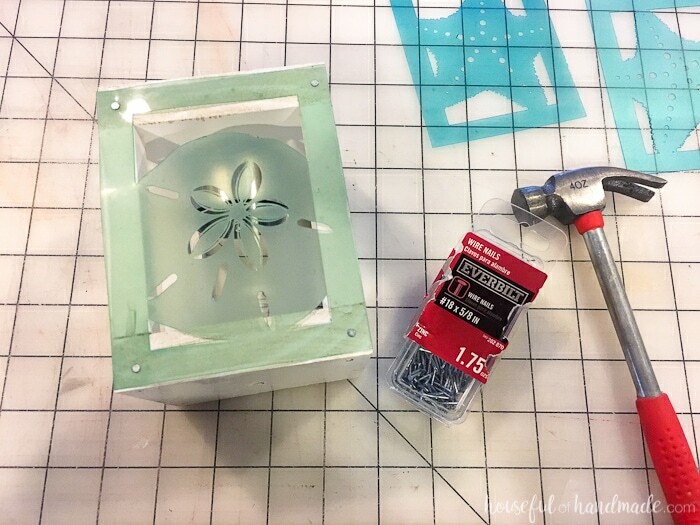 After you cut the lantern side pieces out, spray paint them with the sea glass spray paint. I love this stuff (slightly addicted). I’ve already used it on our summer mantel and I know many more summer projects will be the color of sea glass. 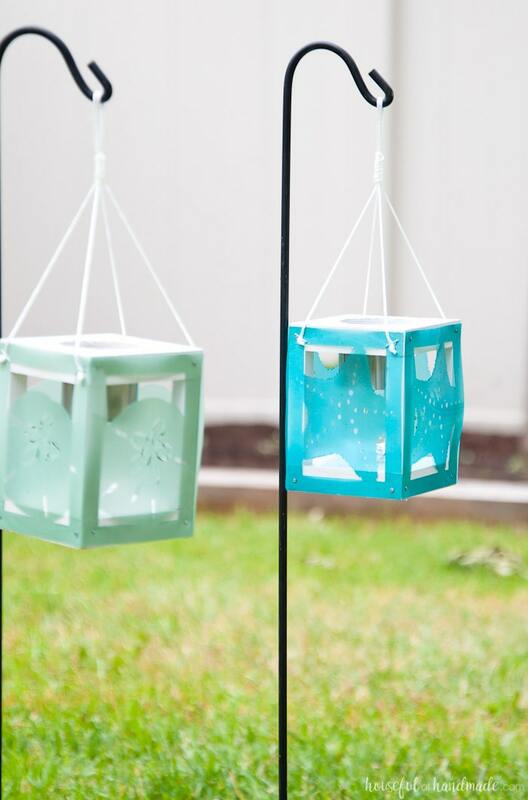 Use a few thin coats to cover the lantern pieces so you get even coverage. When the spray paint is dry, put your solar light into the wood box. 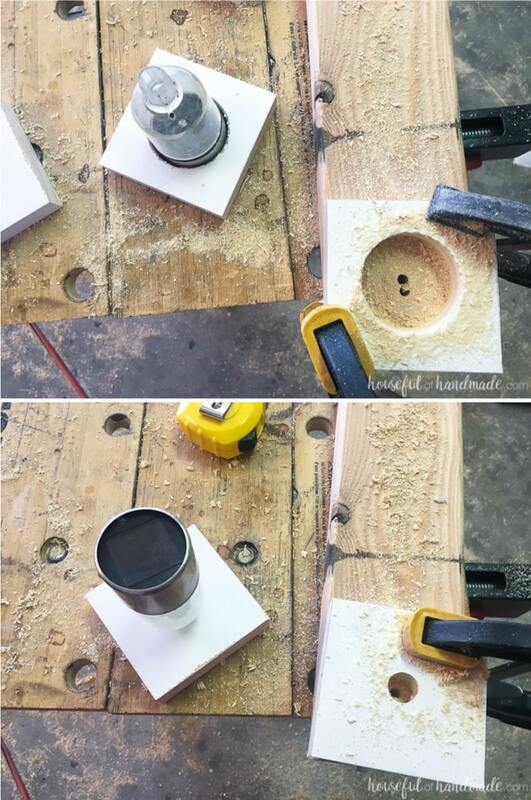 Then carefully attach the sides to the lantern base with the 5/8″ finishing nails. Tap one in each corner. Then add a couple strings to the top for hanging. I used my small staple gun to easily attach the string to the sides. For more coastal flare, wrap another piece of string around the top creating a hook. Secure the string with glue. Now hang your lanterns outside and let the sun charger hem up. They will come on at dusk and supply a bit of lighting and decor for your evenings outside. So much fun! 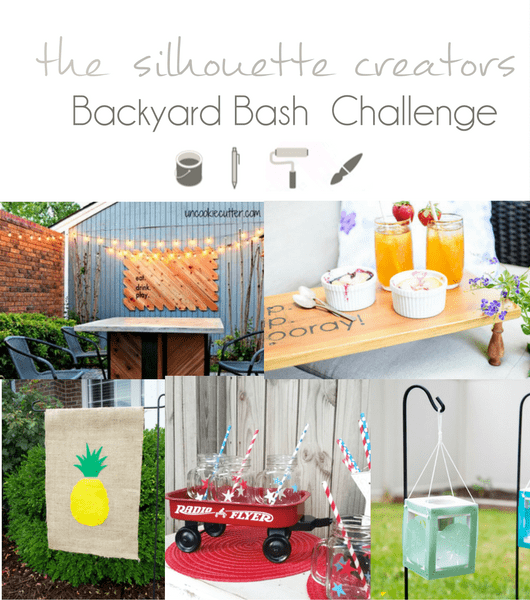 And remember to check out the rest of the projects from this month’s Silhouette Creators Challenge!